Go to Settings – General – Profiles – tap on your Profile – tap on Trust button. iOS 9 introduces a new feature to help protect users from installing in-house apps from untrusted sources. While no new app signing or provisioning methods are required, the way your enterprise users manage in-house apps installed on their iOS 9 devices will change. In-house apps installed using an MDM solution are explicitly trusted and will no longer prompt the user to trust the developer that signed and provisioned the app. 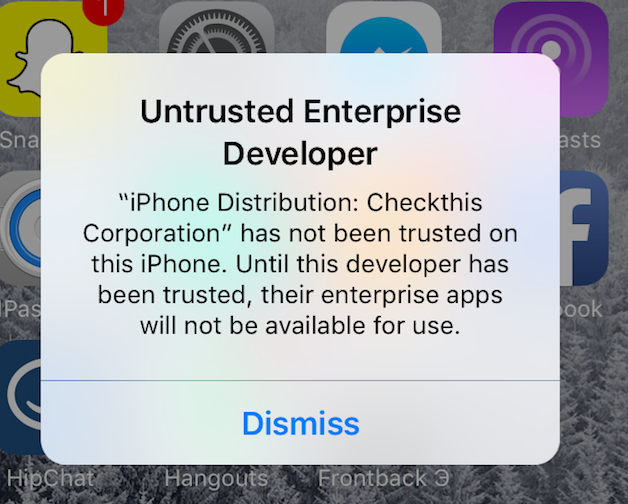 If your enterprise app does not use an MDM solution, users who install your app for the first time will be prompted to trust the developer. All users who install your app for the first time will need an internet connection.